First and foremost the unseeded Naomi Osaka won the Indian Wells Open this past weekend (March 18). The same tournament who’s past leadership guided a policy of exclusion directed at the Williams Tennis Dynasty. Just a few years ago those now in control of the tournament opened their arms wide to both Venus and Serena. These two legends came with trepidation’s given past history. Now that has all changed and Venus the taller one and also the most active one returned with impressive results over the last several years, despite Indian Wells missing her youthful prime performances. Now they are experiencing another resurgence by Venus this year at 37 years of age only to perhaps to see her lose staying power in a defeat to a 20 year old in the semi-finals. If this had gone the way I dreamed, It would have been the opportunity to appreciate the other 20 year old finalist Naomi Osaka play her tennis idol Venus Williams (8). Just a note that Venus knocked out her sister, Serena, a new mom, upon her return to serious competition. Serena will return! 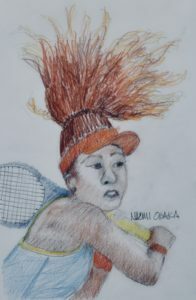 I have been watching the rise of Naomi Osaka for several years. She has the tennis star physique, tall, strong, fast, serves at 125 mph with varying spin and paces and apparently got her mental act together. That demonstration was apparent in her defeat of the world’s number one, Simone Halep in the semi-final run at Indian Wells. The championship was unambiguous as was the final score (63 62) against her also 20 year old opponent Daria Kasatkina ranked (20). This win places Osaka at number 22, her highest so far. Statistics shows she wins at 59.29% and this is also her first WTA (Women’s Tennis Association) title a major accomplishment for an upcoming tennis player. Her grand slam results have been consistent at 3rd or 4th rounds. PS: Since the initial writing of this article, Naomi Osaka played and defeated Serena Williams at the Miami Open only to fall the next round. I hope she remembers that it is difficult to beat Serena twice and savored her victory. Given her size and talent she and Serena will most surely meet again and that will be another story.